The University of Connecticut says the NCAA has found eight violations in the school's men's basketball program. UConn's lead attorney handling the investigation calls this a "major infractions case." The alleged violations include improper phone calls and text messages to recruits, and giving recruits improper benefits, providing false and misleading information to the NCAA and providing comp admissions. 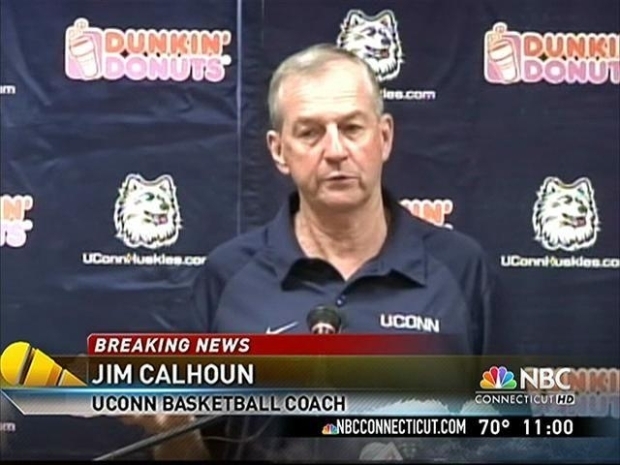 Coach Jim Calhoun was cited for failing to "promote an atmosphere of compliance." UConn would not comment on possible penalties. UConn coach said he is not defeated and UConn will use all allotted time to respond. The school on Friday released an infractions letter it received from the NCAA following a 15-month investigation. UConn is to appear before the governing body in October to respond. “The university and the athletic division are taking this very seriously, as we should. I am confident that the university will appropriately address and respond to this matter and continue cooperating fully with the NCAA as this process moves forward,” UConn President Michael Hogan said in a statement. Hogan resigned from the president's spot earlier this month to become president of the University of Illinois. UConn Director of Athletics Jeffrey Hathaway said university officials and staff would not comment on the specific allegations. "The University of Connecticut is fully committed to NCAA rules compliance and takes this matter very seriously," he said, adding that Calhoun "personally has a long-standing history of demonstrated commitment to NCAA compliance." "In my thirty-eight years as a collegiate head basketball coach, twenty-five of which I have spent at the University of Connecticut, I look with particular pride at our strong record of compliance and the impact that we have had on the young men in our program," Calhoun said in a statement. Two people affiliated with the basketball team resigned before Friday's news conference, where the university announced an update of an NCCA investigation into possible recruiting violations with the team. NBC Connecticut Sports director Kevin Nathan has confirmed that assistant coach Patrick Sellers and director of basketball operations Beau Archibald have resigned their positions. "In order to effectively address the allegations against me, I feel that it is critical that I do so separately from the University and the basketball staff," Sellers said in a statement. "Coaching is my passion and something I have spent many years of enjoyment doing. I want the record to reflect this and for people to see the respect and integrity that I will show toward this process in the months ahead." "In order to best meet that demand, I think it is necessary for me to leave my position with the University and the basketball program. wish everyone the best in the future." Archibald said. The NCAA is looking into the recruitment of former player Nate Miles. Head Coach Jim Calhoun has admitted that he or his staff might have made mistakes during his recruitment. Sellers has been on Calhoun's staff since 2003. Archibald was hired in 2007. According to the notice from the NCAA, UConn must review the allegations and requests for information and respond in writing and provide evidence of anything the school disputes by Aug. 20. The Committee on Infractions is expected to consider UConn's responses during its meeting in Indianapolis on Oct. 15 and 16. As a former team manager, Nochimson could be considered a representative of UConn's athletic interests by the NCAA and prohibited from having contact with Miles or giving him anything of value. Documents released by the school showed pages and pages of phone and text message correspondence between Nochimson and UConn coaches Calhoun, Tom Moore, who is now head coach at Quinnipiac, and Sellers. Read the letter of inquiry from the NCAA to UConn here.